Diagnostic delays. Many people with cluster headache experience at least a 5-year delay in having their symptoms correctly diagnosed as cluster headache. Only 21% of survey respondents reported a correct initial diagnosis. Sinusitis and migraine were common misdiagnoses. Suicidal thoughts. More than half (55%) of respondents reported experiencing suicidal thoughts. Time of attacks. Most cluster headache attacks occur between early evening and early morning hours, with a peak time of midnight to 3 a.m.
Triggers. Alcohol, especially beer, is the most common trigger of attacks, followed by weather changes and smells. Episodic. Attacks recur frequently for weeks or months, separated by long pain-free periods that last months or years. About 90% of people with cluster headache experience episodic cycles. Chronic. Attacks occur regularly for more than 1 year, with pain-free periods lasting less than 1 month. 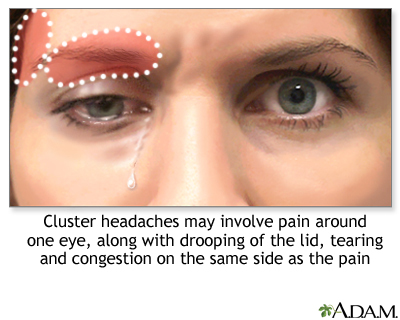 Only about 10% of people with cluster type headache have chronic cluster headaches. The chronic form is very difficult to treat. Paroxysmal Hemicrania. Paroxysmal hemicrania is very similar to cluster headache. It causes multiple, short, and severe daily headaches with symptoms resembling those of cluster headache. As compared to cluster headaches, the attacks are shorter (1 to 2 minutes) and more frequent (occurring an average of 9 to 15 times a day). This headache is even rarer than cluster headache, tends to occur more often in women, and responds to treatment with the anti-inflammatory drug indomethacin (Indocin, generic). SUNCT Syndrome. SUNCT syndrome (short-lasting unilateral neuralgiform headache attacks with conjunctival injection and tearing) causes stabbing or burning eye pain that may resemble cluster headaches, but attacks are very brief (lasting about a minute) and may occur more than 100 times per day. Red and watery eyes, sweating forehead, and congestion are typical. This rare headache is more common in men than women and does not respond to usual headache treatments. Hemicrania Continua. 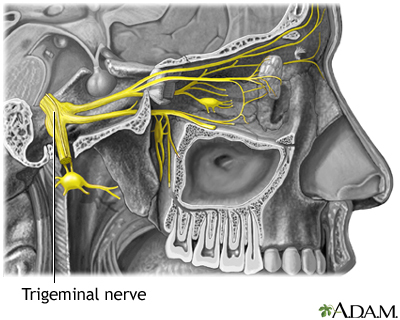 Hemicrania continua is not a TAC type of headache but it produces some symptoms that are similar to cluster headache. The pain occurs continuously on one side of the face and is typically of mild-to-moderate intensity with some instances of severe pain. Unlike cluster headache attacks, which do not last long, attacks of hemicrania continua can last from days to weeks, with constant moderate-to-severe pain. Hemicrania continua is more common in women than in men. It is treated with indomethacin. Evidence strongly suggests that abnormalities in the hypothalamus, a complex structure located deep in the brain, play a major role in cluster headaches. Advanced imaging techniques have shown that a specific area in the hypothalamus is activated during a cluster headache attack. Click on the icon to see an image of the hypothalamus. Serotonin and norepinephrine. These are neurotransmitters (chemical messengers in the brain) that are involved with well-being and appetite. Drinking. Alcohol consumption is a major risk factor. Alcohol, especially red wine and beer, is the most common attack trigger during active periods of headaches. Smoking. Cigarette smoking and tobacco products are risk factors for cluster headaches. These headaches are more common in people who smoke. However, quitting smoking does not appear to stop attacks. Stress. Emotional stress and physical exertion are risk factors for triggering cluster headaches. Frequency and Duration. Cluster headaches generally last 15 minutes to a few hours and can occur several times a day. A single migraine attack is continuous over the course of one or several days. Behavior. Cluster headache sufferers tend to move about while migraine sufferers usually want to lie down. Alcohol. Heavy alcohol use is associated with cluster headaches. Cigarette smoking. A majority of people with cluster headaches are cigarette smokers. While studies have not shown that quitting cigarettes will stop cluster headaches, smoking cessation should still be a goal. Smokers who cannot quit should at least stop at the first sign of an attack and not smoke throughout a cycle of active headaches. Heart and Circulation Problems. Triptans narrow (constrict) blood vessels. Because of this action, spasms in the blood vessels may occur, which can cause stroke and heart attack. This is a rare but very serious side effect. People with a history of heart attack, stroke, angina, uncontrolled high blood pressure, peripheral artery disease, or heart disease should not use triptan drugs. Serotonin Syndrome. Serotonin syndrome is a life-threatening condition that occurs from an excess of the brain chemical serotonin. Triptans, as well as certain types of antidepressant medications, can increase serotonin levels. These antidepressants include selective serotonin reuptake inhibitors (SSRIs) and serotonin-norepinephrine reuptake inhibitors (SNRIs). It is important not to combine a triptan drug with an SSRI or SNRI drug. Serotonin syndrome is most likely to occur when starting or increasing the dose of a triptan or antidepressant. Symptoms include restlessness, hallucinations, rapid heartbeat, tremors, increased body temperature, diarrhea, nausea, and vomiting. You should seek immediate medical care if you have these symptoms. In very preliminary research, spinal cord stimulators have shown promising results in patients with cluster headache. As these devices are prone to complications, they are not recommended for routine use until more research can be done.